These grilled New York strip steaks are cooked to perfection and topped with a slather of roasted garlic butter made from garlic, olive oil, butter, mustard, and Worcestershire sauce. Boo-yah! There’s grilled steak. And then there’s perfectly grilled steak. indirect-medium to direct-high cooking for Jamie’s utterly delicious steak recipe. Make sure your family and friends are gathered round the grill to watch the show as you slide the steak, causing flames to lick at its underside. If you want a little grilling visual aid, watch this cooking video starring Jamie Purviance and our very own David Leite. 1. Preheat the grill, setting it up for indirect heat. 2. Remove the loose, papery outer skin from the garlic head and cut about 1/2 inch off the top to expose the cloves. Place the garlic head on an 8-inch square of aluminum foil and drizzle the olive oil over the top of the cloves. Fold up the foil sides and seal to make a packet, leaving a little space at the top for steam to escape. Grill over indirect medium heat until the cloves are soft, 30 to 45 minutes, depending on their size. 3. Remove the foil packet from the grill and let cool. Squeeze the papery husks to release the cloves into a bowl. Using the back of a fork, mash the garlic together with the remaining garlic butter ingredients. Cover and refrigerate until ready to serve. 4. Season both sides of the strip steaks with the salt and pepper, pressing them into the meat. Let stand at room temperature for 20 to 30 minutes before grilling. 5. Lightly rub or brush both sides of the steaks with the oil. Grill over direct high heat, turning once halfway through grilling time, until the internal temperature reaches 145°F (63°C) for medium-rare, 8 to 10 minutes, depending on the exact thickness. Remove the steaks from the grill and let rest for at least 5 minutes. 6. 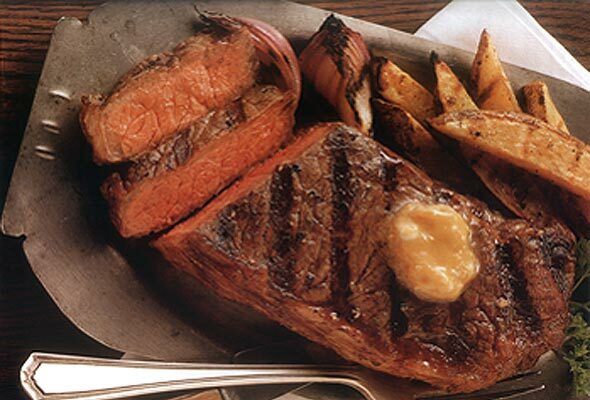 Divvy the garlic butter into 4 equal-size portions and dollop it on top of each steak. My husband is slightly apprehensive when it comes to compound butter with steak because he loves steak grilled without embellishment. Well, turns out he loves this one, too, as do I! The roasted garlic, Worcestershire sauce, Dijon, oil, salt, and butter worked beautifully together. The steaks were a perfect medium–rare after 8 minutes. We let them rest but it was difficult as we just wanted to dig in! The steaks were meltingly tender and the butter made them, well, buttery. This particular butter is more subtle than I thought it’d be after first reading the recipe ingredients, so it’d pair nicely with roasted garlic mashed potatoes or tossed with sweet potato fries. Don’t worry about the butter and juices dripping down your chin—it’s natural. 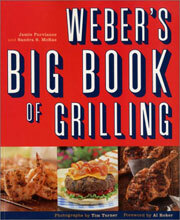 Grilled New York Strip Steaks Recipe © 2001 Weber-Stevens Product Company. Photo © 2001 Tim Turner. All rights reserved. All recipes and photos used with permission of the publisher.